Are you sill mystified and baffled by the mysteries of the Red Book? By popular demand, we are bring back the Legal Citations Clinic. When: Wednesday, November 9th, 1:00 – 2:30 p.m.
How: Two law librarians will be answering your questions for 1h and 20 min after a 10-minute introduction. First come first served. All law students welcome. Come and bring your citations questions! We all know that e-exams for the past years are not available for the faculty of law. 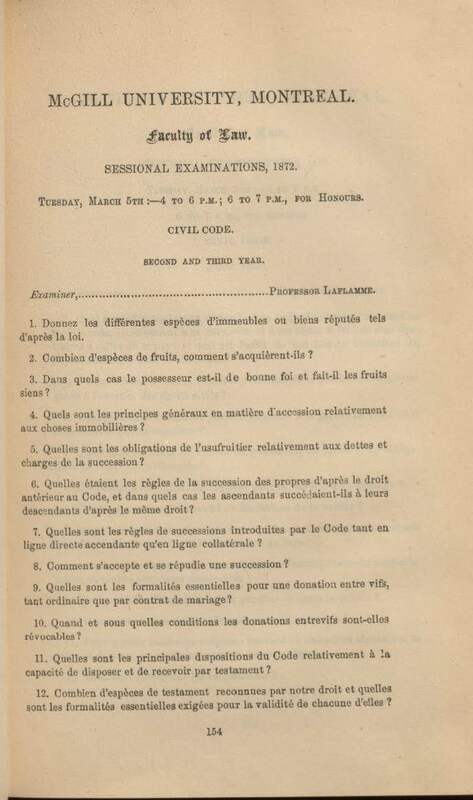 Not to exactly fill this gap, but to at least provide you with an insight into how the exams looked like for the 19th century McGill law students, we have digitized a volume from our Rare Books Collection that gathers the examination questions for the years 1861-1896. You can find there for example, the questions for the sessional examinations on the Civil Code for the second and third year students that were held on Tuesday, March 5th, 1872. Another glimpse into the student life of the days bygone is allowed by the scrapbook made by law students preparing for moot completion in in 1915-1916. 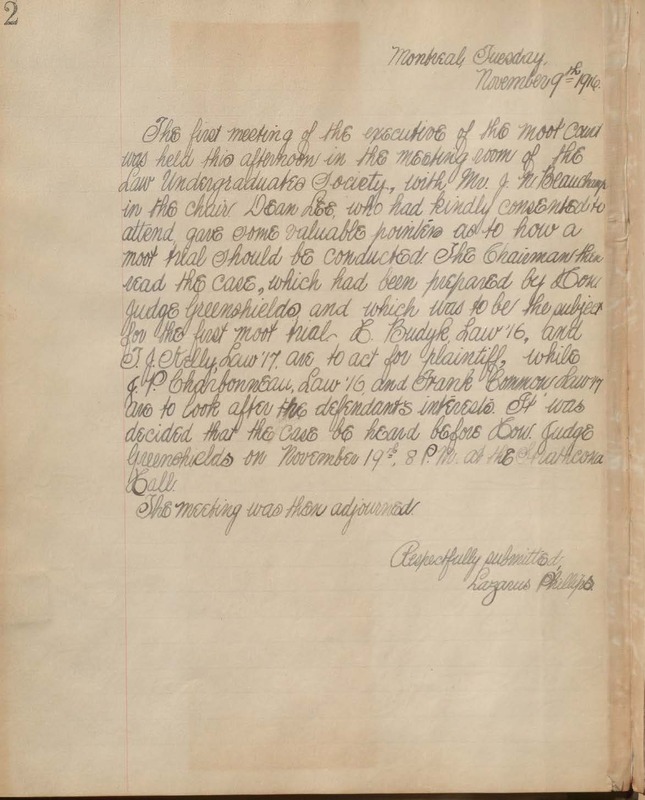 The book contains handwritten accounts of the meetings, clippings from contemporary newspapers, a typewritten case Brown vs. Jones assigned to the students and the moot court decision. This is not a literary text solicited by the co-editors-in-chief for this issue of the Quid, but more of a continuation of the re-emerging theme of my column, an unsolicited advice about the library. Today, I would like to talk to you not about a new “cool” rare book or a useful database that we recently bought but about something totally unglamorous and rather dull: library fines. This choice of topic is not random. From the reference desk, I begin to notice the traces of sleepless nights and mid-term-induced stress at the law students’ faces. [Here, a law student harassed by the looming deadlines and incomprehensible mysteries of the Red Book (sorry, McGill Law Journal) should burst into a fit of sarcastic laughter. “She sees how stressed we are, and she wants to speak about WHAT?”] Yes, I would like to talk to you about library fines. Not out of a malevolent desire to fill your life with a bit more stress and to see how you can handle it, but to help you, to make library fines easy to understand, and thus, easy to avoid. 1. Recall fines for books – $5 per day. As McGill students, you can borrow 80 books and renew them for an unlimited number of times. Following this logic, it may seem that you can borrow a book and keep it until you graduate. You can… unless the book is recalled. To make it possible for students and faculty members to share library resources (i.e. books and journals), any borrowed item can be recalled. Anything that you have on loan is subject to immediate recall if needed for reserves, or after 14 days from the date of the original loan if requested by another library user. When something is recalled, you receive a recall notice from the Library at your McGill student e-mail. You must return the item by the new due date or you will be charged $5 per day, with a maximum fine of $100 per item. Check your McGill e-mail every day. When you see a recall notice, bring the book to the library. Before you leave Montreal for vacation, holidays, or a visit, return all the books to the library. If you prefer not to do so, find a trustworthy friend/ classmate/ relative whom you can leave keys to your apartment/ room. Keep checking your McGill e-mail when on holidays (some people love working during Christmas vacation, so the books ARE being recalled even then). If a book is recalled, ask your friend to go to your lodgings, get the book, and return it to the library. It may sound horribly insensitive, but the fact of being on vacation “up North”, on Bahamas, etc., is not a sufficient reason to waive your library fines (see below about fine waiving). 2. Reserve fines – $0.02 per minute. First, what are reserves? Reserve materials are books and other items that because of high demand have short loan period. 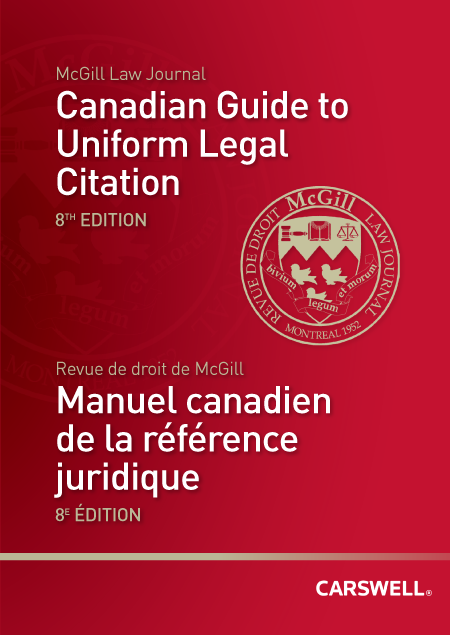 In the Law Library, the reserves are mostly books that are required readings for a class or some ever-popular titles, such as Canadian guide to uniform legal citations, a.k.a. Red Book. The loan period for all reserve items is 3 hours, after which the fines will kick in and will be calculated 24 hours/day. They can be borrowed overnight if they are borrowed within 3 hours before the closing of Library services. Course reserve items borrowed overnight will be due back one hour after Library services begin the next day. This means, if you borrow a reserve book on Thursday after 3:00 p.m., you can have it until Friday 10 a.m. At the Law Library, the reserve books borrowed on Friday after 3:00 p.m. need only be returned on Sunday before 11 a.m.
Avoid returning the reserve books borrowed before 3:00 p.m. after the service desk is closed. The mere fact of putting a book in the reserves return bin does not take it off your account because the return bin is really, you know… just a bin. It is not a fancy technological contraption that will check in books once they hit the bottom. It is a simple wooden box that will keep the books safe until the next day when one of our library assistants opens the service desk and checks the books in. For you, this means that the book stays on your account the whole night and the fines keep accumulating until the morning of the next opening day with a maximum of $100 per item. What to do if you have already accumulated library fines? Last two or three weeks (as usual on this time of year), there was number of students looking for help on how to cite the sources for their first memo. For their benefit, I decided to reiterate my last year’s not-totally-unsolicited advice on the matter. Ask a librarian for a help. We will not do or check your footnotes, but we will walk you through the maze of the Red Book (no offence meant) to make sure that the next time you will be comfortable to use it by yourself. Do not be shy to come several times if you need more help, and please, please do not come 5 minutes before your paper is due – in this case, we can only commiserate with you. When your TL gives you a piece of paper, a pdf, or a photocopy of something, ask what this is, and from where it is coming from (book, website, encyclopaedia, etc.). You will save some precious minutes (or hours) later when you are pressed for time and have to finish your work by a deadline. It is quite unpleasant to discover suddenly that the TL’s piece of paper is a book chapter, and you have no slightest idea about the book title and/ or author. Add some common sense and reasoning to the Red Book. Do not expect it to contain a correct form of footnote for every possible source. Red Book will not necessarily have an answer to your particular question. When you have something to cite, think about what rule fits the best the type of source that you have in hand. Read carefully the section to apply the rule, do not scan and skim the text. As you probably know, there is a heated debate going on in Ontario about the future of articling. In May 2011, the Articling Task Force was established by the Law Society of Upper Canada as a result of the rising number of unplaced articling candidates seeking access to the licensing process in Ontario. The Task Force produced a 100-pages report released on October 16th, 2012, where the majority recommended a five-year pilot project, to begin in 2014, for a law practice program as an alternative option to the current articling system. The LPP (law practice program), delivered by one or more third-party providers, would combine a skills-training component and a co-op work placement for a total of eight months. Four dissenting members of the Task Force instead suggested replacing articling with a two- to three-month comprehensive transitional pre-licensing program that would consist of online courses and exams. They also called for the law schools to introduce additional experiential education programs that would allow students to gain the practical skills they need to enter the workforce. You can find the full text of the report here. Last week, I saw a number of 1st year students seeking an advice of a librarian on how to cite the sources that they used in their first memo. Thus, I decided to give you some not-totally-unsolicited advice on this matter. First, when your TL gives you a piece of paper, a pdf, a photocopy of something, etc., do not hesitate to ask what this is and from where it is coming. This will save you quite a bit of time when you are pressed to finish your work but discover suddenly that this photocopy is in fact a book chapter, and you have no idea about the book title and/ or author. Second, do not wait until the last minute to make your footnotes. Everybody works differently, but my experience shows that if you ‘cite while you write’, you will save time. You will have your paper AND your footnotes ready, save for the final proofing, when you finish writing the last paragraph. On the contrary, if you leave all your footnotes to be done when your paper is written, you will end up trying to figure out where you found this or that quotation and, pardon me, freaking out about supra(s) and idem(s) when you are totally short of time. Third, use the Red Book in conjunction with your common sense and with some reasoning. Do not just scan and skim the text of a section, expecting that a correct form of citation will jump in your eyes. Red Book is not the Bible, so do not expect that it will necessarily have an answer to your particular question. When you have something to cite, think about what rule fits the best your type of source and then, apply this rule. As promised, I am posting the dates of the database presentations. All students are welcome. Seeing that a considerable amount of space was dedicated to the discussion of food matters in the last Quid Novi http://quid.mcgill.ca/, I would like to add my little share to this conversation. I enjoyed reading “The Law students guide to business lunch etiquette” by Mary Angela Rowe. Personally, I am convinced that it is about the time to remind to everybody about the table manners that have been almost destroyed by the invasion of fast-food, plastic-plate, hastily-eaten meals. To somebody who is interested in the topic I can suggest searching our Classic Catalogue – Advanced Search – Keywords in subject – table etiquette. 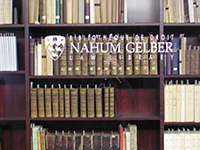 The McGill Library has an interesting selection of books on this topic ranging from “The rituals of dinner: the origins, evolution, eccentricities, and meaning of table manners” to “Galateo; or, A treatise on politeness and delicacy of manners… With the whole art of carving; illustrated with a variety of cuts”. Once again, I am reminding you that scanning is FREE for McGill students if you are using either one of big multifunctional Xerox machines or an over-head scanner at the second floor.